Saudi Arabia and several other OPEC members want oil prices to rise to $60 a barrel. But surging U.S. production will probably prevent them from achieving that goal. After initially aiming to boost crude oil prices to $55 a barrel, key OPEC members like Saudi Arabia, Kuwait, and Iraq have now set their sights on $60 a barrel oil. This target -- along with rumors that OPEC would extend the production cuts announced last November -- helped spur an oil rally earlier this month. However, crude prices have fallen back toward $50 a barrel again in the past week or so. Rising U.S. production is holding oil prices down. Image source: Getty Images. Indeed, the rapid rebound of U.S. oil production will make it very difficult for oil prices to reach $60 a barrel on a sustainable basis. Low-cost producers like Continental Resources (NYSE:CLR) and EOG Resources (NYSE:EOG) have shown that they will ramp up production long before oil hits $60 a barrel. Thus, unless Saudi Arabia is ready to lead an even bigger OPEC production cut, oil prices are likely to stay grounded for the foreseeable future. U.S. drilling activity plunged beginning in late 2014, bottoming out about a year ago. But drilling activity bounced back very quickly once oil prices started to recover from the lows of early 2016. 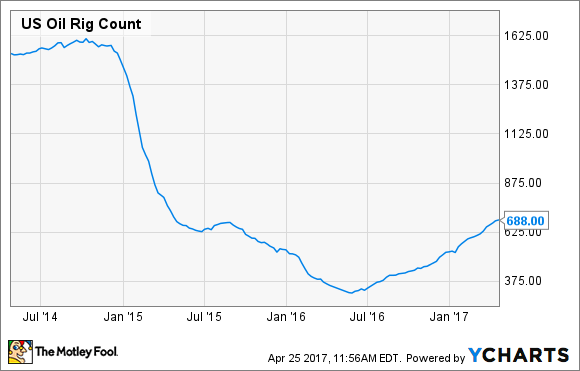 The U.S. oil rig count has more than doubled over the past year, although it remains well below 2014 levels. Moreover, U.S. oil producers have become vastly more efficient in the past few years. To some extent, this has come from renegotiating oil-field service contracts and from focusing on drilling in the best locations. However, there have also been meaningful operational improvements to reduce costs and improve output for each well. The net result is that domestic oil production is set to surge past the record high of about 9.6 million barrels per day (bpd) reached in mid-2015. Domestic production bottomed out near 8.4 million bpd in mid-2016 but has been climbing steadily since Labor Day. U.S. crude oil output recently reached 9.3 million bpd, up from less than 9 million bpd at the beginning of the year. U.S. Crude Oil Field Production, data by YCharts. U.S. oil production is likely to continue rising at a rapid pace even if oil prices stay near $50 a barrel. First, taking account of recent cost cuts, producers can be highly profitable at many sites with oil prices in that range. Second, the number of wells that are drilled but uncompleted (i.e., not yet "fracked") remains at record levels for a variety of reasons. For example, EOG Resources says that it has about 6,000 "premium" drilling locations left in its inventory. These sites can generate stellar after-tax returns of at least 30% even with oil at $40 a barrel. 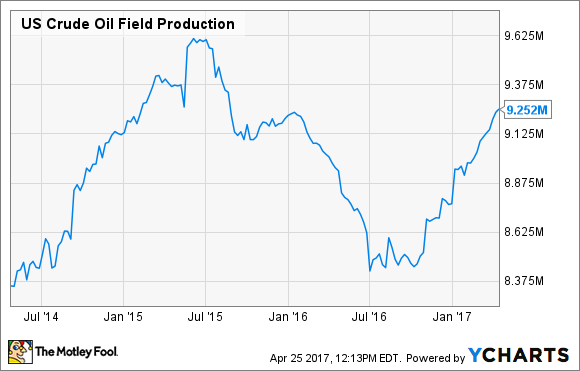 Continental Resources and EOG Resources are both on track to return to profitability in 2017, even with oil prices remaining relatively low. Their profitability should improve further in 2018, as they benefit from this year's production growth. With efficient shale drillers like Continental and EOG ready to turn on the taps as soon as oil prices rise, OPEC can't simply will oil prices higher. Of course, talk about output restrictions can lift oil prices in the short run. However, each rally sows the seeds of its own demise, by allowing shale drillers to hedge more of their output, locking in favorable prices to support further production growth. U.S. crude oil production is already up by about 300,000 bpd year over year and has risen more than 800,000 bpd since bottoming out in mid-2016. Based on recent increases in the rig count and the large backlog of uncompleted wells, production growth is likely to stay strong in the coming months. If Saudi Arabia is determined to boost oil prices to $60 a barrel or higher, it will probably need to cut production even further. Yet even that would be just a temporary solution, as it would encourage U.S. drillers to become even more active. A more likely outcome is that Saudi Arabia and its OPEC allies will have to settle for oil at $50 to $55 a barrel for the foreseeable future.